Engaging with C-Suite executives is no longer optional for most B2B providers. More than 90% of respondents in a recent ITSMA survey say executive engagement is more important to sales strategy than it was two years ago. Especially in areas such as digital transformation, we need to reach higher in client organizations and engage with new types of buyers and decision makers, such as chief digital officers, chief risk officers, and even board members. The good news here is that the executives we’re trying to reach are hungry for new ideas as they navigate digital transformation and look for innovative ways to compete. They’re looking for thought leadership and anxious to explore new approaches to growth in the connected economy. But as more and more companies invest in thought leadership, the competition for mindshare in the C-Suite has become intense. Breaking through the noise requires a well-orchestrated process that goes far beyond simply producing and promoting credible thought leadership content. ITSMA’s 2018 Thought Leadership Study, Engaging Executives with Ideas and Innovation, documents the approaches that B2B marketers are taking to develop and use thought leadership to engage and strengthen relationships in the C-Suite. I discussed the five issues on a recent webcast with two members of ITSMA’s Thought Leadership Council, Melody Callaway, Director of Marketing at NTT DATA Services, and Eran Levy, Head of C-Suite Thought Leadership at Cisco. Companies that are successful with thought leadership go beyond just working to increase awareness and interest in their ideas and solutions. They focus directly on strengthening executive relationships and collaborating with them to develop new insights and innovations as core objectives of their thought leadership programs. “If your thought leadership program does not bring your clients in, you’re missing a huge opportunity for relationship building,” says Melody Callaway. Her team focuses on primary research and says making clients a stakeholder in your research process is key to success when the actual research rolls out. One of the biggest challenges in using thought leadership to reach executives is creating points of view that are truly differentiated from peers and competitors. Me-too content and presentations are rarely worth executives’ time. Thought leadership programs typically rely on primary research and internal subject matter experts to help develop new points of view, but the most effective programs cast a wider net. Sales and accounts teams can add valuable insights, for example, so it’s important to get them involved up front, rather than simply relying on them to present new approaches after they are developed. Eran Levy says bringing sales into the thought leadership program early has resulted in overwhelmingly positive responses, with 94% of the sales team reporting a positive impact on sales goals. The best programs typically involve a range of other sources in the R&D phase of thought leadership through one-on-one executive meetings, events, and advisory boards, as well as industry events and associations. This broader and deeper approach certainly requires more time and effort, but pays off with better-vetted ideas and new points of view that are more likely to connect with executive concerns and ways of thinking. Beyond just gathering their insights, leaders are more than twice as likely to prioritize collaboration and co-creation. They focus on using programs such as innovation workshops and executive councils not just to share their approaches but to collaboratively develop new ideas and points of view. It’s not thought leadership for clients and prospects—it’s thought leadership with clients and prospects. One of the biggest opportunities for co-creation may be in industry-focused thought leadership and account-based marketing (ABM). For example, NTT DATA worked with Hilton Hotels to design and conduct research together about customer experience and customer satisfaction. The project put Hilton customers through their full “customer friction” audit process, and then used the research findings to co-create a better solution for Hilton guests. Collaborative innovation programs have become an investment priority for many B2B companies in recent years, but they often reside in groups outside of corporate marketing. So, the challenge for thought leadership programs is often more focused on tapping into these programs to support thought leadership development than actually starting entirely new initiatives. 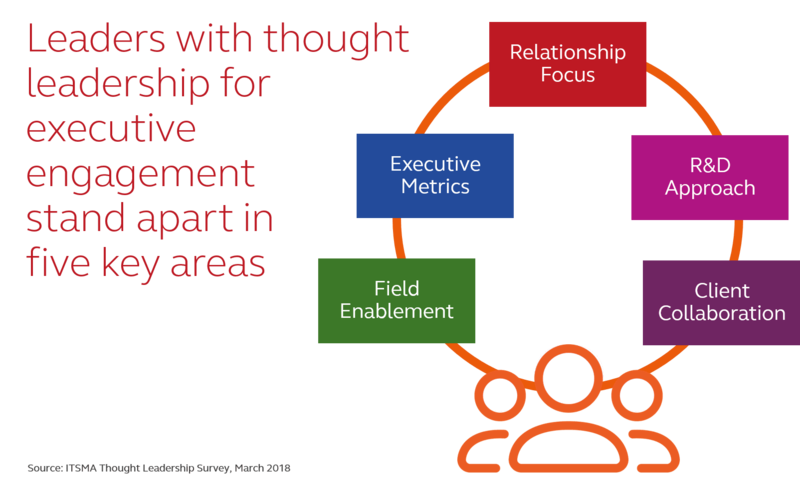 Enabling the field is key to bringing thought leadership to the C-Suite. By activating your own executives, sales teams, and business partners, you are able to not only articulate thought leadership insights and messaging, but also fuel more innovative conversations. As Cisco’s Eran Levy points out, “It’s one thing to publish your research and promote it with digital channels. It’s another to have 20,000 sales people that can articulate the very same message.” Now, when Cisco’s sales reps meet with customers, they don’t just talk about Cisco’s collaboration solutions, but reframe the conversation to speak to the C-level about how those solutions impact company culture, productivity, and employee satisfaction. The most effective enablement programs combine education and training on how to use thought leadership at the executive level with programs and platforms to facilitate direct personal and small group engagement – briefing programs, innovation programs, executive sponsorship programs, and the like. For the leaders, this all translates into significantly higher numbers of sales people, SMEs, and others that are effectively able to engage in the C-Suite with thought leadership ideas and content. Most thought leadership programs focus on brand impact. They’re looking to strengthen reputation and eminence in target markets and with priority audiences. But the most effective programs emphasize and measure all three strategic R’s in marketing: Reputation, Relationships, and Revenue – and do a much better job in the latter two. They are much more effective in building executive relationships and using thought leadership to accelerate revenue. And they are much more effective in tracking, analyzing, and reporting on the impact of thought leadership on executive engagement. To be sure, this kind of measurement is difficult, especially since many of the most effective thought leadership activities with executives are happening offline, in small groups, and one-on-one. Even for the leaders, measurement quality is not great; it’s just a lot better than what the followers are doing. As Melody Callaway notes, for example, NTT DATA Services is just beginning to test ways to connect thought leadership and executive engagement initiatives directly to sales opportunities and pipeline acceleration. Interested in learning more about the research and the discussion with Melody Callaway and Eran Levy? Check out the full report and the webcast, and let me know if you have any questions or comments. We’d love to continue the conversation! Marketing for Digital Transformation: Who’s the Buyer?